Copper sulfate has been used for centuries as seed treatment and also to treat fire blight in dormant trees. 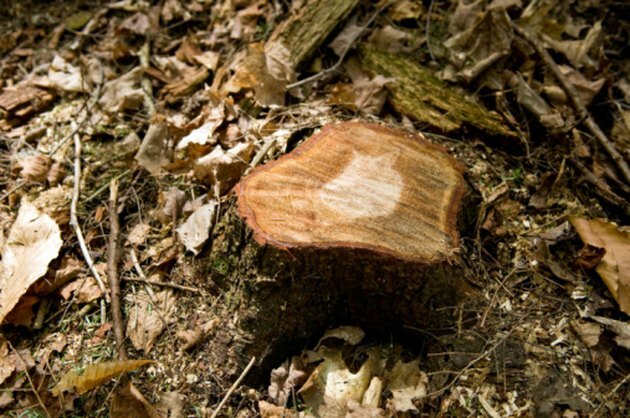 While not a common practice, copper sulfate can be used as a chemical agent to burn out a tree stump if other methods of tree stump removal have not worked, such as digging, rotting or grinding out a stump. You can use copper sulfate to burn out a tree stump, which you can then remove from your landscape. Copper sulfate will aid rotting in a tree stump. Dig out as much of the tree stump as you can before applying any chemical treatments to it. If you can, grind away the top of the stump with a stump grinder, or use a saw or chain saw to cut down the stump as close to the ground as possible. Drill several 1-inch holes into the stump and space the holes approximately one inch from each other. Try to drill the holes at a 45-degree angle, and drill down 12 inches deep. Insert copper sulfate into the holes and pack it tightly. Do not touch the copper sulfate with your bare hands. Use the end of a hammer or long stick to pack the copper sulfate into the stump holes. Cover the holes with a plastic garbage can lid and then weigh the lid down with bricks or concrete blocks. Do not use a metal lid, as the copper sulfate will corrode the lid. Wait several weeks. The copper sulfate will not dissolve the tree stump. It will merely speed up the rotting. You may need to add additional copper sulfate after a few weeks and repeat the covering process.